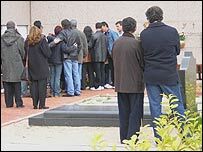 Funerals in Spain, as elsewhere, are of course emotional occasions for family and friends of the deceased. 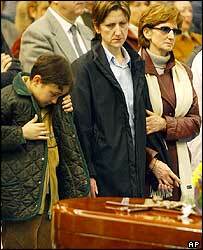 The first few funerals of victims of the 11 March attacks on Madrid were no different in that sense. But in those very private moments of grief, the relatives could be assured that the sympathy of a nation was with them. Telephone worker Pilar Cabrejas, 37, and Air Force officer Felix Gonzalez, 53, were among the first to be buried in the town of Alcala de Henares on the outskirts of Madrid. More than 40 people from the neighbourhood died in the blasts on a train from Alcala to Atocha station in the capital. The bodies of Ms Cabrejas, who lived with her long-term partner, and Mr Gonzalez, who was married with children, had been brought to a gymnasium on the edge of town which was going to be used as a temporary morgue, before the authorities decided to take other victims into the city. The gymnasium became a place of worship on Saturday as Alcala's Bishop Jesus Catala and 20 priests led a mass for the dead. Tears were shed by friends and neighbours who knew them and some relatives draped themselves over the coffins, overwhelmed by grief. The bishop had a message for the bombers behind the tragedy. "Under no circumstances, theological or nationalistic, is this massacre justified," he said. Whoever did this, he said, had lost their humanity. After an emotional service, which ended with a respectful applause, the coffins were taken to the Cementario Jardin cemetery for burial. One mourner, Victoria Caminguez, had her own thoughts about who was behind the attacks and what should happen to them. She said the members of the Basque separatist group Eta, who the Spanish government has blamed for the bombings, should be killed. "The government has got to do something, it is horrible," she said. "These people will keep on killing, they enjoy killing. They are terrorists and we have to go after them." One of the priests at Ms Cabrejas's burial, Padre Manuel Rubianes, said it was necessary for people to express their pain in whatever form. He said people in his parish, which is near the Alcala station where so many boarded a train never to return, were left feeling helpless, sad and angry. "But thank God many people are finding the strength to deal with that suffering and remain strong," he said. "It is serenity and strength that will console them. We can't even talk about getting back to normality yet. In this kind of tragedy and violence and terror there will always be a sense of before and after." Padre Manuel said knowing that there was emotional support and sympathy from across Spain and across the world was some comfort to the families. Also on hand to offer support to families were members of the Red Cross and other voluntary organisations which have been working at morgues, hospitals and cemeteries since Thursday. Red Cross volunteer Maria Reina, 25, and her colleagues from San Fernando de Henares y Coslada, help grieving relatives who are overcome by grief and faint, offering comfort and medical aid if necessary. She said fainting was normal at funerals in Spain but the enormity of the situation had made things harder to bear for many. "This has been too big, the impact for people is bigger," she said. "But we have to go on and forward without fear." 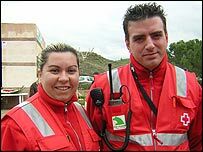 Her colleague Sergio Samper, 30, has been in the Red Cross 12 years but said this was the worst he had seen. He said it was sometimes hard to contain his own emotions when caught up in such an intense moment. "But you have to be brave to help other people," he said. As the families of Ms Cabrejas and Mr Gonzalez try to come to terms with lives without their loved ones, other families from Alcala, Madrid and elsewhere will certainly be in need of such support. "Pilar is not Alcala de Henares' only loss"